Thanhouser Career Synopsis: Known as The Thanhouser Kid, Marie Eline worked with Thanhouser from autumn 1909 through early 1914. During the 1910-1912 years she was by far the most famous of all the Thanhouser players. Biographical Notes: Anna Marie Eline, born in Milwaukee, Wisconsin on February 27, 1902, the daughter of Grace and Charles Eline, became known as The Thanhouser Kid. She started in films with the Thanhouser Company at the beginning of business in autumn 1909. Her first release was A 29-Cent Robbery (April 15, 1910), in which she played the lead role, a little girl whose bank was stolen. Grace, her sister, also appeared in this film. Marie played female and male juvenile parts with equal facility. 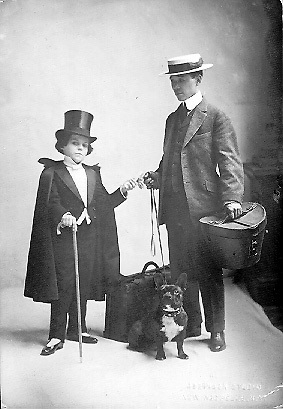 As one of many examples of a male role, in The Judge's Story she essayed the role of a young black boy, to critical acclaim. Her acting on the screen was praised in numerous reviews in The Billboard, Moving Picture World, and other trade journals during the early years of the Thanhouser Company, when few other actors were mentioned by name. During 1910 and 1911 she was mentioned more frequently in Thanhouser advertising than were all other players combined. The Moving Picture World, January 13, 1912, informed readers: "The Thanhouser Kid has no other name for picture purposes. She is just the Thanhouser Kid." Marie Eline was seen in dozens of films. Her versatile acting was a major contributor to the success that the Thanhouser Company enjoyed during its formative years. 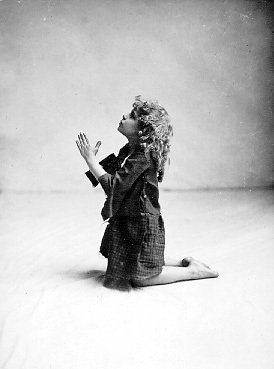 A 1912 Photoplay Article: The Photoplay Magazine, November 1912, told of her acting abilities: "Marie Eline (Thanhouser), known to all as 'The Thanhouser Kid' is one of the greatest child actresses on the screen or the legitimate stage, and is loved and admired wherever Thanhouser films are shown. Born in Milwaukee, Wisconsin, this clever little actress has assisted such stars as Guy Bates Post in The Bridge, Fanny Ward in Van Allen's Wife, appeared in The Fatal Wedding, in La Belle Russe and with Nora Bayes and Jack Norworth in The Jolly Bachelors. Frequently this little lady is called upon to enact emotional scenes that would puzzle a Bernhardt, a Mrs. Fiske or a Leslie Carter, especially when one recalls that pantomime alone can be used and that spoken words are useless, yet little Marie 'puts over' the scene with all the naturalness of real life." Her Personal Life in 1912: An article by Gertrude M. Price in the Toledo News-Bee, December 30, 1912, gave details of the young actress' personal life: "This is a story for Toledo youngsters who see the 'Thanhouser Kid' in moving pictures. It's all about dollies and alligators and 'doggums' and things like that. To begin with, her real name is Marie Eline. She lives in New Rochelle, N.Y., within a few blocks of the 'movie' studio. And when she isn't working, she's at home with her mother and teacher, practicing, learning and playing. "Marie has brown curly hair, brown eyes and an olive skin. She is beautiful. But she is not vain. Just think! Her salary is $100 a week! But the best thing I know about this 10-year old moving picture star is that she is a dear, simple, dolly-loving kiddy. I traveled all the way to New Rochelle, N.Y., to see her. When I got to the Thanhouser studio this $100-a-week kiddy had just been 'burned up' in a picture! Of course, she wasn't really burned at all, but the thin, pink dress she wore actually caught fire and was full of big burned patches when I saw it. "Marie and I fell in love at first sight. When she whispered to her mother to invite me over to dinner so I could see her dollies and 'doggums,' and the baby alligator.... Her home is bright and cozy. The first things I saw were a violin and a mandolin on the piano. "There was a whole couch-full of dolls of all sizes, dressed and undressed; some sleeping, some staring and some with their heads turned to the wall. "Oh, yes, and I mustn't forget to tell you about Toodlums Thanhouser Eline! He is a French poodle and Marie's constant playmate. He was a Christmas gift from Mr. Thanhouser. Maybe you've seen the movie picture called Doggie's Debut, a play which was written especially for him. He eats when Marie eats and whines when he can't go where she goes. Besides being a successful moving picture player, Marie sometimes acts on the speaking stage. She is a clever imitator, too. She sings and swims, and fences, and rides. She rows with one oar because her arms are not yet long enough to reach across a boat. But the pictures are her chief delight. You'll remember her holding poor puss by the tail in the picture called The Commuter's Cat; as Dan Cupid in the Tempter [The Tempter and Dan Cupid - Ed. ], and as 'Leo' in She. Marie Eline wears pretty clothes without being silly over them and she doesn't know what it means to stick up her nose at other little girls less fortunate than she." A Visit to Cleveland: The New York Morning Telegraph, April 30, 1913, printed this item: "Marie Eline, The Thanhouser Kid, and her sister, Grace Eline, who plays juvenile parts with Thanhouser, have the distinction of being the very first motion picture players to have an interview with Mayor Baker [of Cleveland]. While playing a vaudeville engagement the Misses Eline were invited to City Hall for a visit and had a chat with the mayor. On April 26th the Thanhouser sisters will close their month's engagement here, which has been a most successful one, and will return to the New Rochelle studio for several weeks before they leave on a second vaudeville tour which will include the Central States." "I was delighted at this opportunity, and the early rising was no trouble to me, as many of my friends claim that I never go to bed at all. I was at the Eline home bright and early, but begged to be allowed the less strenuous exercise of consuming a cigar while Baby Marie and her sister Grace took their horses for a canter through the beautiful scenery surrounding New Rochelle. They are both skilled riders, and after their return, during breakfast, they entertained me with stories of their experiences. Immediately afterward Marie's tutor was ready to impart the daily lessons, and Grace took the train for New York, where she was rehearsing in The Lady and the Slipper, which the the new play in which Montgomery and Stone and Elsie Janis will star this year, and in which Miss Grace will have a part. "Lessons are over at nine, and a visit to the nursery reminded me of the toy section of a department store. Everything was there to charm the heart of a youngster - books, toys, and dolls of all descriptions, her favorite doll being one as big as herself. Besides these she has some pets, which include a French poodle, a canary, several goldfish, and a small alligator which her company sent her last winter from Florida. "It was now time to go to the studio, and her favorite doll was chosen to accompany her this morning; though I understand Toodles gets the preference generally, being her favorite playmate at all times. Reaching the studio I was shown her dressing room, which is all done in light blue, the color she likes best. On one side of the room were all her costumes, which include everything one could possibly imagine - from a ragged boy's suit to one of those flossy creations of the dressmaking art which are seen to best advantage on Michigan Boulevard or Riverside Drive. In almost no time after I left her room she appeared before me dressed up as a poor newsboy for a part she was to play that day. She seemed as much at home in this garb as in one of her own dainty little dresses. She confided to me that this was her favorite character, and that she hoped she would never get too big to play a small boy's part. The afternoon's work called for her as a dwarf in a circus, and in this, too, she appeared just as much at ease as ever. "Four o'clock sees her day's work at an end, and then an hour of outdoor play is enjoyed. This day being pleasant and warm, bathing was decided upon, and the way this youngster takes to the water is almost enough to excite the envy of Annette Kellermann. However, a part of the playtime every day is devoted to fencing, which is another of her accomplishments. For the ordinary child this would seem to be about sufficient for one day. But not so with Baby Marie. She seems to be a little bundle of concentrated activity from morning till night. The hour remaining before dinner was spent with her violin teacher; and after dinner came another hour of play with her dolls or pets. More often she likes to dress up and imitate some big actress, as she is accustomed to go to the theatre on Saturday to see the work of the best players. "Like most all 'good kids' she goes to bed early. But, so that nothing may be overlooked, her maid puts her through a little physical culture, which has made her a healthy child, capable of doing everything that is necessary to realize her great ambition, that of becoming a 'big star.' As to myself, never having done anything more strenuous than managing a baseball team out in the wilds of South Chicago, I was unused to such activity, and welcomed the end of the day for the rest which it would bring. Yet, with very little change, this is the daily routine of the little 'star' whom we all like so well while watching her on the screen. "And how few of us appreciate how much is required to be done to fill this little life and make her so capable; for all her work is really necessary to cultivate the requirements of a thorough and painstaking actress. She has the fencing, riding, and dancing to cultivate health and grace; the visits to the theatre to study various characters, and the study of music for her temperament, so that even while at play she is improving her time. Not only does it take time and hard work to accomplish what she does, but often she is obliged to take some chances, as when riding unruly horses or toppling off the rocks, or off a bridge into the water fully clothed. Many pages might have been written of these troubles, dangers, and pleasures of the moving picture actor - which are seldom realized by the public who are rarely favored with a closer view of the lives of their popular idols than their finished work upon the screen." 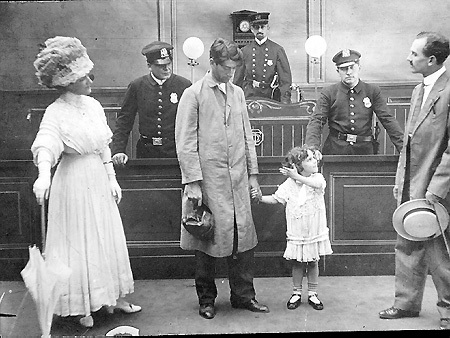 In Films and on Stage: In the summer of 1913, amid her film work, she found time to appear on the stage at Proctor's Fifth Avenue Theatre, in New York City, where she dressed in rags, in the role of a poor child from a broken home, and gave a monologue imploring a judge to spare her father from prison. 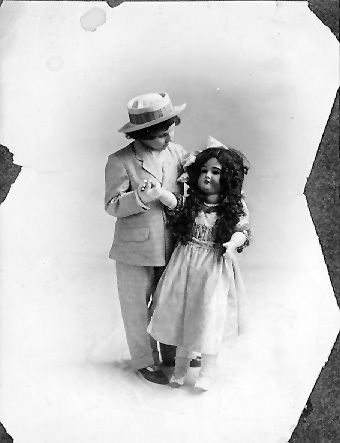 Marie was mentioned in an article, "Children of the Photoplays," by Jean Darnell, in the December 1913 issue of The Photoplay Magazine: "One of the most interesting of these children is little Marie Eline, known as the Thanhouser Kid. 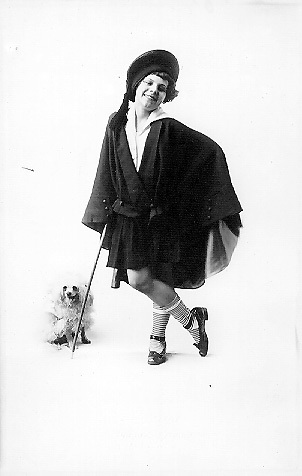 Little Marie has been a professional child all her life, playing in large dramatic companies when a very tiny mite. I believe she was barely four when she played with Fanny Ward in Van Allen's Wife. She also played with Nora Bayes in the Jolly Bachelors, but very soon after Marie went to the Thanhouser stock company, playing in motion pictures, and there she has been over three years. "Marie is as great an actress today for her size and age as Bernhardt, and just as finished in her work. However, here is this little kiddie working hard nearly every day, but with it she has her allotted amount of rest and recreation; she has a private tutor and a maid, who do nothing but look after her, so she suffers none from her work, and in the meantime has gained a wonderful training which will be of great use to her when she grows up." She was known as The Thanhouser Kid until November 1913, when Charles J. Hite announced that Marie Eline had been transferred to the Princess Department, was no longer to be known as The Thanhouser Kid, for she was "nearly 11" and grown-up. It is evident that by then her star had dimmed, and she was relegated to occasional mentions in Thanhouser publicity. After that time, she remained with Thanhouser just a month or two. Uncle Tom's Cabin: Marie Eline left Thanhouser early in 1914 and went back on the stage. The New York Dramatic Mirror, February 18, 1914, noted that she "will shortly open in a novel vaudeville offering that is being prepared for her by James Madison. The act carries a special drop, is introduced by a novel picture, and on the whole is expected to made vaudeville patrons sit up and take notice." 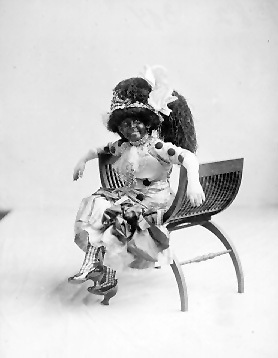 The same trade publication noted in its issue of April 15, 1914 that Marie Eline was breaking her vaudeville contract "to go to New Orleans with the World Producing Company, which is to produce a film version of Uncle Tom's Cabin, featuring Miss Eline and Irving Cummings." With the World Producing Corporation she was under the directorship of William Robert Daly in Uncle Tom's Cabin, appearing as Little Eva, the role she had played earlier in the 1910 Thanhouser version of this American classic. Irving Cummings, who was in transition and was set to go with Thanhouser, appeared in the role of George Harris. Other players included Sam Lucas (Uncle Tom), Garfield Thompson (Uncle Tom in other scenes), Walter Hitchcock (George Shelby), Hattie Delaro (Mrs. Shelby), Master Abernathey (George Shelby, Jr.), Teresa Michelena (Eliza), Paul Scardon (Haley), Garfield Thompson (St. Clair), and Roy Applegate (Simon Legree). A news item in The New York Dramatic Mirror, May 27, 1914, told of a narrow escape in connection with the filming of this picture: "A leap into the Mississippi River nearly cost Marie Eline, the Thanhouser Kid, her life. The youngster was engaged on a feature production of Uncle Tom's Cabin and fell from a Mississippi flatboat, the intention being to have her saved by Uncle Tom [Garfield Thompson]. The strong undercurrent drew both under the boat, and had it not been for the quick and brave work of Director Bob Daly, Irving Willat, the cameraman, and Garfield Thompson, who jumped into the river and brought both Uncle Tom and Eva back to land, the pair would have been lost." Another account, by Marie Eline's daughter, named Marie's sister Grace as Marie's rescuer. Released on August 10, 1914, the film was reviewed in The New York Dramatic Mirror, August 12th. 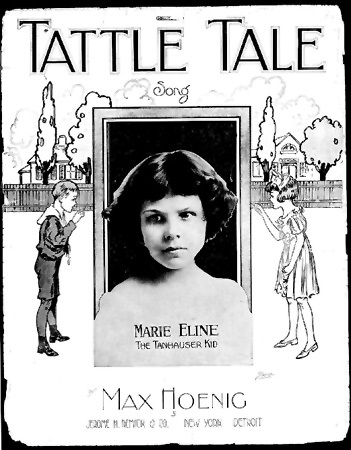 Marie's role was reviewed in The Moving Picture World, August 22, 1914: "Marie Eline, long known on the screen as the Thanhouser Kid, has the part of little Eva. No odds need be asked on account of her childhood. Her characterization of the happy little daughter of the St. Clairs is charming, her portrayal of the decline and death is worthy of an adult." For a number of years after Marie Eline left the New Rochelle studio, she continued to be referred to as The Thanhouser Kid in publicity, for it was by this name she was recognized by millions of movie patrons. Sometimes she was billed as The Original Thanhouser Kid, for by the time she departed from Thanhouser, a number of other children were among the Thanhouser stock players. Gerald Badgley, father of Helen Badgley (The Thanhouser Kidlet), stated in an interview with Thomas Fulbright, published in the Fall-Winter 1967 issue of Classic Film Collector: "'Yes, I knew her (the Thanhouser Kid) well.' Right here a rather sad look appeared on his compassionate face. 'I understand that she had a very sad marriage and life. Her name was Marie Eline. Her mother was a wardrobe mistress at the studio. The Thanhouser Kid was a CHILD star, while Helen was a BABY star. There was no conflict between the children or their families.'" Back On Stage: The Toledo Times, April 23, 1915, carried this item: "'The most photographed personage in the world' is the reputation possessed by Miss Marie Eline, known as the Thanhouser Kid, who is starring in a little sketch at Keith's this week. Miss Eline has appeared in 150 reels of moving pictures. Each reel contains 1,000 feet of film, and each foot contains 16 pictures. This gives her a total of almost 2,000,000 pictures in the three years during which she played for the Thanhouser Film Company." 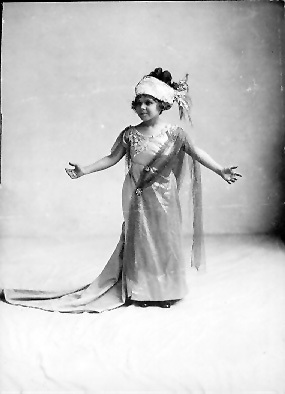 The same newspaper, edition of April 27, 1915, told of her stage activities: "Marie Eline, the little Thanhouser Kid, at Keith's this week, has been called the cleverest child that has ever appeared in vaudeville. She knows she has been called that. She knows just how popular she has been and still is, for she is constantly hearing from admirers she has never seen; hearing from them in a material way, too. One sent her a watch the other day. Others sent her money, et cetera. In spite of all this she is just a sweet, modest, natural little girl. "No one ever heard her boasting of what she could do. Ask her about her ambitions, though, and she'll tell you that she wants to be like Sarah Bernhardt. This is more than an idle wish with her. In spite of the fact that she is still in her early 'teens and likes to play with her dollies, she's working hard - very hard - to attain her ambition." The Hartford Daily Courant, August 3, 1915, told of a local performance: "Marie Eline is decidedly the sensation at the Palace Theatre for the first three days of this week. Marie is well known to motion picture fans as 'the Thanhouser Kid,' as she has appeared in child roles in hundreds of films, but the real flesh and blood Marie was first introduced to the Hartford public yesterday. She appears with her own 'company,' consisting of a boy of almost as tender years as she, but Marie manages to take two parts so successfully that the audience is kept mystified as to whether there are two or three people in the company. "The playlet is entitled Springtime and has a unique setting. The story concerns the struggle between a good little girl and a bad little clown girl who has run away from a circus, for control over a boy. The good little girl eventually wins and the little clown girl reforms and goes back to lead a better life, or so we hope. Marie takes the parts of both girls to the satisfaction of the audience, and later appears before the curtain and delivers an Italian imitation of first rate quality. 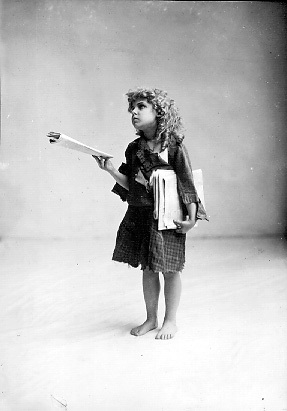 No adult appears in the entire sketch...."
The next day, the Daily Courant told more: "Marie Eline, the Thanhouser Kid, loved and admired by photo fans all over the world for three years, and considered the most brilliant child screen star ever photographed, is winning thousands of vaudeville admirers by her clever work in Springtime, her own playlet which she presents with her own company and with special scenery and effects at the Palace for the last of her engagement today and tonight. Incidentally, the management has surrounded the little star with a fine bill of vaudeville acts...."
The Pittsburgh Post, February 2, 1916, told of Marie Eline's visit to the city: "This is laughing week at Sheridan Square Theatre. Three shows yesterday pleased capacity audiences. Beginning with the Clairment Brothers, grotesque clowns who do funny things on revolving ladders, the bill runs through every variety of vaudeville. Marie Eline, famous among patrons of movies as the 'Thanhouser Kid,' appeared with Kingdom Brown, in a sketch of real life entitled Springtime. She is a pretty girl of 14 with an angelic face. She was greeted with hearty applause." The Philadelphia Record, January 12, year not certain but possibly 1916, told of Marie on stage there: "East Philadelphia boys and girls are in the act called The Song Doctors, seen yesterday for the first time here at the Grand. They gave a most diverting entertainment. The Road to Tomorrow, with Marie Eline as the leading member of the cast was a grateful fairyland playlet." A 1917 Interview: The Newark (New Jersey) Star Eagle, November 14, 1917, published an interview with the actress: "MOVIE 'KID' LIKES 'HAND' - Otherwise Marie Eline Would Prefer Screen to Stage Acting: 'It's the risks that I like in the movies,' said little Marie Eline, the 'Thanhouser Kid' who appears personally this week in an act in Loew's Theatre. "'And to think, said the mother, who hovered out in the background, that my two daughters could become domesticated and that they give up [balance of article missing]." The Columbus Journal, January 8, 1918, carried this item: "Youth is much in evidence among the players who are supplying acts at the Broadway this week. This is especially true of Apple Blossom Time, a playlet being presented by Marie Eline, 'The Thanhouser Kid.' Miss Eline is just 16 years old, and the boy who appears in the sketch with her is only one year her senior." In 1919 Marie Eline was back in films and worked for a time in Los Angeles with the National Film Corporation of America, where in publicity she was billed as The Original Thanhouser Kid. National maintained studios at 1401 Lodi Street, Hollywood, and released through the Robertson-Cole Company, located at the same address. 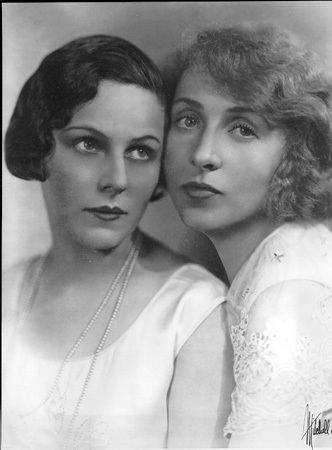 The 1920s and Later: In the 1920s, Marie Eline traveled extensively, often with her sister, and was seen in many stage productions, usually billed as Grace and Marie Eline. The two were seen in a 1928 vaudeville act, The Original Thanhouser Kids, which traded on their fame in films 15 years earlier. 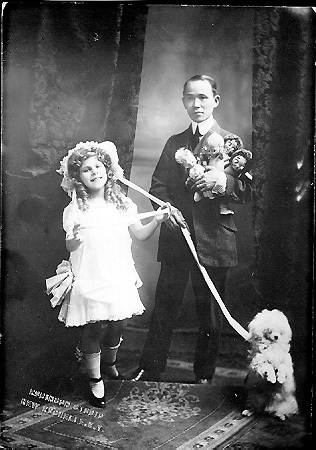 Marie Eline married Milton Edward Blasier, Jr., in Riverside, California in 1922. The couple had one child, a daughter, Marie Elizabeth ("Mary"), born on March 4, 1924 at the Clara Barton Hospital in Los Angeles. An earlier child, a boy, was carried for an incomplete term and was stillborn. In 1988, Marie Eline's daughter told the author: "Marie had to leave her husband, Milton E. Blasier, as he was a very cruel person. When Mother became pregnant with me, my father locked her in a room. He was jealous of me from the time I was conceived as he did not want to share my mother with anyone. My mother never told me of these things, and I heard them from my Aunt Grace and my Grandmother Grace (whom I named Ga-Ga, and from then everyone in show business called her Ga-Ga). Mother would never speak ill of anyone and corrected me when I did, including whenever I spoke critically of my father." An unattributed 1926 newspaper clipping preserved by the Eline family relates: "Milton Edward Blasier, said to be the manager of the Rancho del Guerra in California, was arrested yesterday at the Hotel Alamac on a civil order obtained by his wife, Mrs. Marie Blasier, who is staying at the Alamac, from Supreme Court Justice Wasservogel. She alleged that he had threatened to dispose of his property, said to consist of $30,000 in securities and an interest in a $500,000 estate, and for that reason Mrs. Blasier might be unable to collect any alimony awarded in a suit for separation. After the papers had been served by Deputy Sheriff Murphy, Blasier was released on $1,500 bail. "Mrs. Blasier said she had married the defendant in Riverside, California, in 1922, and that she had been compelled to leave him when he abused her at their home in Hollywood, California in April, and broke up the furniture. They have a daughter, two years old. Her assertation that her husband said when he arrived here several days ago that he intended to dispose of his property was corroborated by her sister, Grace Eline, a vaudeville actress, with whom she is living." Milton E. Blasier, Jr.'s father, Milton, Sr., died on April 28, 1925. His will, dated April 25, 1923, provided that his stepson, Milton, Jr. (the husband of Marie Eline), receive $4,000 per year from the estate for six years, plus 20% of the income. The balance of the income was to be divided between his widow, Sarah J. Blasier, and his stepson, with the principal of the estate to go in its entirety to Milton, Jr. upon the death or remarriage of Sarah. His widow contested the will, stating that she was to have received half of the $239,179 estate, but that Milton, Jr. had induced his father, then of alleged unsound mind, to provide otherwise, by telling his father that Sarah had married him only for his money and that she did not care for him and, in fact, was seeing other men. The estate was largely comprised of real estate in the Los Angeles area, including the Blasier Apartments at 641 St. Paul Street, valued at $135,000, and a ranch in the San Fernando Valley, valued at $90,000. 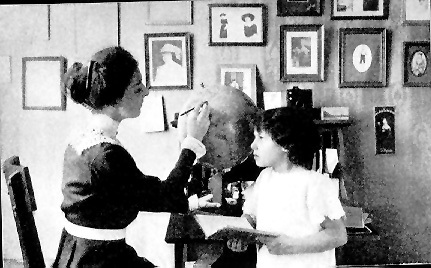 In 1988, Marie Eline's daughter recalled her mother's life: "There were no stunt men or doubles when my mother was a child actress with Thanhouser. In one film she was in a scene which took place on a high train trestle. The Thanhouser crew had to film the action as the train approached the trestle, where Marie was to be, with her foot wedged under the tracks. The hero [William Russell] was to run onto the tracks, scoop her up under his arms, and race off the trestle, thereby saving her life. A child's shoe at the time was typically laced up above the ankles. "What really happened is when the hero grabbed Marie and started to lift her, her foot turned and really became wedged in the tracks. As the hero struggled with her, the onlookers realized there was a big problem and panicked, for the train kept coming and wasn't slowing down! In the midst of this excitement, Marie's mother calmly untied her daughter's shoelaces and lifted her up and ran to safety. "In another instance of danger, Marie in the role of Little Eva, filming Uncle Tom's Cabin [for World], when Little Eva and Uncle Tom fell into the water. Uncle Tom was supposed to have saved her life, but it turned out that he couldn't swim, so Marie's sister Grace went to the rescue. "Marie had the most forgiving nature. She never spoke ill of anyone and always looked for and found good in everyone. When she smiled there appeared a deep dimple in each cheek. She grew to only four feet seven and a quarter inches tall, and had a perfect figure with an 18-inch waistline and naturally soft, curly hair. She never complained to me about any of her troubles, and she had many in her lifetime. "Marie was a very honest person. She didn't care for people who lied, and she would not tell a lie, if she could help it. The most she might do would be to prevaricate slightly. I know that I was raised with the understanding that if I always told her the truth I would not be punished for something I did that was wrong, but if I lied about it I would be punished. She also told me and raised me this way: If I really wanted to do something desperately that was very important to me as a child or teenager and I said, 'Well, Mother, I just have to do it,' she would very sweetly say, 'Well, darling, if you can give me a better reason for wanting to do this particular thing than the reason I can give you for not doing it, then you can do it.' And it always worked out that way. We could sit down and talk, discuss it, and if she thought I had a good enough point, I was right. "Marie was an excellent mother. She was never too tired or too busy for me, even when she was in vaudeville. When she was doing two or three shows a day and would come home late at night, after the theatre closed, I would be asleep - with a maid or nurse watching me at all times. When she came home she would stay up to do things for me, like putting together a Tinkertoy set, so I would find it all assembled when I woke up. Whenever she had to go on the road, she would always call me every evening at my bedtime, regardless of what she was doing. She was never too busy for me, and she spent as much time as she could with me, so I would know that I had my mother - and I did. "Later, in New York City, Mother married a man named Joe Reems. I think it was in 1932. Joe was in vaudeville, and Mother was also. Joe was the one who taught me to tell time, so it may have been before 1932. I don't know how long this marriage lasted, but I know that Mother married Hal Thornton, her last husband, before 1935. Hal was a singer and played the piano. He entertained in night clubs. He adored my mother, but he was a womanizer and an alcoholic. When he had been drinking, he physically abused my mother; I remember that well. This was the only man my mother deeply loved and never got over. The only reason she left him was because of me. She did not want me to be around that type of man. "Mother and I left New York in 1940, or late 1939, enroute to California. Mother stayed in California until about 1960, at which time she moved to Miami to live with her sister, Grace. My mother had a stroke in 1978 or 1979. I moved her to Toutle, Washington - about 25 miles from Mt. St. Helen - to be with me. I lost my beloved mother on January 3, 1981. Mother was a wonderful person, my best friend, and she was a friend to all who knew her." Marie Eline died in Longview, Washington on January 3, 1981. An obituary in Variety, January 28, 1981, noted in part: "Marie Eline, age unreported, died in Longview, Washington while visiting her daughter. 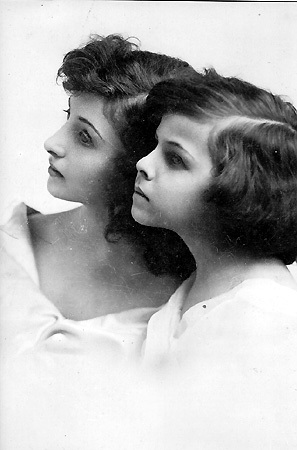 With her sister, Grace, the Elines played the Keith and Orpheum circuits, starting in show business in 1910. They appeared with Nora Bayes in The Jolly Bachelors, and then Marie went into films, and Grace joined Elsie Janis in Lady of the Slipper. After Marie appeared in a production of Rose Marie, the sisters went into vaudeville, but retired from show business in 1948. Marie Eline, who took the name of Anne B. [Bruce] Carlisle upon retirement, is survived by her sister and daughter." Her daughter, Mary Eline Grundberg (later remarried to become Mary E. Scheet), supervised the funeral arrangements, which were conducted in Longview by the Steele Funeral Home. The remains of Marie Eline were cremated by the Green Hills Memorial Gardens, Inc. 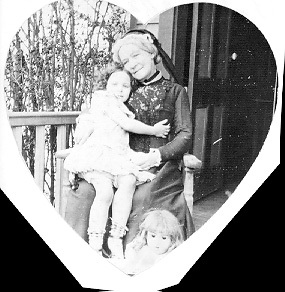 The author conducted numerous interviews with Mary Eline Scheet, Marie's daughter, who furnished many recollections, clippings, photographs, and other items concerning her mother. Marie Scheet has one child, Gary D. Sprague, the only grandchild of Marie Eline. Notes: Marie Eline's name was misspelled numerous ways in publicity. Her first name appeared as "Maria," "Mary," "Marina." and "Marine," among other variations, while her surname was listed as "Aline," "Kline," and even "Flynn," the latter appearing in several different places. One account The New York Dramatic Mirror named her as "Rhea" Eline.